This self-paced course gives the professional caregiver an opportunity to increase their understanding and ability to assist with all aspects of care of those with serious illness and those who are at the end of life. It focuses more on the spiritual and emotional care of the dying and their loved ones, encouraging, recognizing and supporting best practices of palliative care across the continuum of healthcare. This course is an endeavor to inspire a gentle change in our relationship to dying and to living, by encouraging all of us to view death as part of the cycle of life, to practice self-care regularly, to face our own mortality with grace and compassion, and to consider our own preparations for death and dying, in order to better serve our patients and our loved ones. 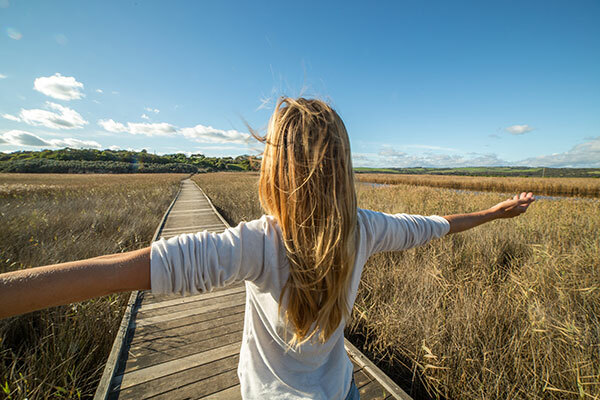 Thus, we can be empowered to live each moment more fully and wisely. Get the Brochure and Join the Interest List! The Journey of Self-Awareness is an online program that teaches professional self-awareness in the midst of challenging and stressful careers. It helps health care professionals reflect on their approach to caregiving and identify ways to balance that with their own self-care. 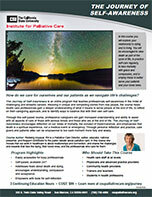 The experience of this course will help you, and allow you to help your patients change the cultural outlook about death and dying from one of fear and anxiety to one of acceptance and compassion; to encourage more conversation about death and dying, in a culture where it is still a Taboo subject; to enlighten you on nuances of dealing with difficult and challenging situations at the end of life. 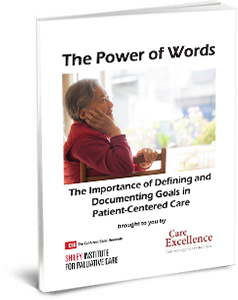 The Journey of Self-Awareness utilizes the power of stories from professionals and non-professionals in discussions relating to palliative and end of life care. There will be reading, journaling and thought-provoking questions to help you look deep inside at your caregiving career and your personal life, with the goal of allowing you to assess your own self-development and ability to advocate for seriously ill patients in a variety of settings. Redwing Keyssar’s engaging tales chronicle people she has cared for as a “midwife to the dying” over the past twenty years. In this course she reveals the challenges and rewards that face the dying, their loved ones, and the professionals who care for them. While encouraging us to examine our personal relationship to impermanence, Ms. Keyssar also calls upon us to consider changes that could be made in our healthcare system that would further the cause of palliative care—the relief of suffering for patients and their loved ones. This self-paced course provides concepts of caring for the dying that are both caregiver and client/patient focused, and rely on self-awareness, self-care and well-developed interpersonal communication skills. Not only is Ms Keyssar an expert in palliative care, she is a passionate caregiver, a heart-felt writer, and an exceptional teacher. Learn more about her at: http://lastactsofkindness.com/.